The story of The Chocolate Festival and its founder, in her own words. Cat Black: Have you always been foodie? Yael Rose: When I think back, yeah. I have lots of food memories. I grew up in Israel, and now I am organising Chocolate Week over there. The chocolate we had was like Cadbury’s, and we used to have it with Bamba, a type of Israeli crisps. That is my first memory of eating chocolate. CB: So you ate chocolate with crisps? YR: Chocolate with crisps, with Mitz Petel, which is like squash, like cranberry juice. When I think back I think what an odd combination, but that is what we had when we were kids! My mum used to bake quite a lot when I was little, and we used to help her. She stopped, unfortunately, and she can’t remember any of the nice recipes! I remember my brother going to pick up Zaatar, you might have seen it mentioned in Yotam Ottolenghi’s programmes. 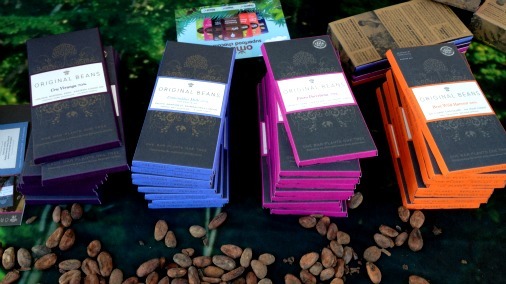 These days Yael's have access to the finest chocolate, such as these bars from Original Beans. CB: You mean the herb? YR: Yes, from the thyme family. It is beautiful. My brother used to go and pick it in the valley and then dry it. My mother would grind it and make bread with it, and she would make her own labne with it too. It was heaven! CB: So you were born in Israel. Are you from a big family? YR: I am a male twin, and I have a big brother. My parents divorced and my father’s new partner came with two more boys. So I grew up with four boys! Then I ended up with four boys! I guess it is what I know. CB: What is your professional background? YR: I never finished school, I didn’t get on in school. My Dad used to work for the foreign office and I was born in a Kibbutz. My parents are Argentine, of Syrian Lebanese descent. When I was two my dad was asked by the foreign office to travel and teach people about Israel. We went to Uraguay, then Argentina and travelled in North America and Europe before returning to the Kibbutz. In a Kibbutz you only got to stay in children’s houses. But I lived a normal life in Latin America, so when we went back to Israel, back in the Kibbutz, to a small community, I had my eyes open. CB: That must have been hard! YR: I loved the earth, but I didn’t love the language. I was always new and out of place, I was bullied a lot. The teachers didn’t get me. So when I was fifteen I left to go to art school, photography, drawing, sculpture, print. Then when I was 17 I went to photography school in Haifa for a year, and after that I went into the army. Lots of elegant choices at Rococo. CB: How long did you have to serve in the army? YR: It was short for me. I didn’t like it. It is two years I think for girls now. I struggled because again it was a fixed system. CB: You are a non conformist! YR: Yes! But in the army I had a very privileged role, and that is how I started to learn to organise things. I was the only secretary of the deputy of one of the Israel’s three commanders. We had confidential and difficult stuff to deal with. If you had something needed doing you had to stay up all night. In the army I was the visits coordinator for the North. Say if the General of France wanted to come, all the arrangements were down to me. 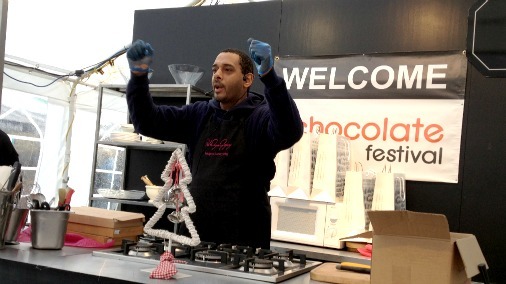 The Chocolate Festival at its London home on The Southbank. CB: So you gained a strong work ethic! And you learnt organisation skills. YR: Yes, I got that from the Kibbutz as well. From the age of 12 you had to work one day a week. Then in the holidays you had to work for 40 days a year. I worked in the kitchens there, preparing vegetables and cooking. When I left the army I was looking for something to do. I learnt about nutrition, as my father was dying of cancer, I got into healing through food. Sadly it was too late for him, he died when I was 22. All this time I also worked as a waitress, which I quite liked. Selling food, if you love it, is easy. In Israel you don’t make a salary, you only makes tips. So it is better if you sell more, and selling desserts was my big thing. 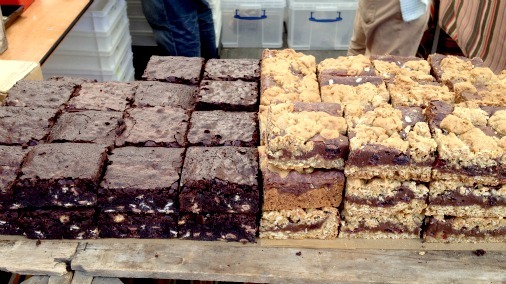 CB: What was the catalyst for you start organising food festivals? YR: It was really by chance. At that point in my history I came to the UK, got married, and started having kids. Baby’s clothes in Israel are amazing, so I started bringing some over. I wanted to put some into the Baby Show at Excel, but it was too expensive. I thought maybe I could organise my own event. So I ended up doing that, and for a number of reasons gave the profits to Tommy’s the baby charity. I got really good feedback about my event organisation. I did another one for them, and got the bug for organising events. It was sporadic at that time, as I was having babies, and had times when I didn’t work. YR: I have always loved chocolate, I am a chocoholic! My husband laughs at me that I do the things I love! Chocolate, cheese and wine! CB: Well it is a cliché for a reason, work at that which you love and you will be able to do it well. YR: I saw the television show about Willie Harcourt Cooze, and thought I would like to do something. I was searching for a venue the South Bank was suggested. I felt inadequate, I only just knew about South Bank and there I was contacting them with my suggestion. But I got a great response, they loved my idea and wanted to meet up. CB: That is what I call chutzpah! YR: That first time I only had 9 weeks! It was really hard. What really changed things for me was Damian Allsop. I talked to him and he was really supportive, and helped me to get William Curley and Paul Wayne Gregory on board. Once I had those three names on board it started to happen. I had twenty stands. I wouldn’t say that they were all the most amazing quality. But many of the good ones have stayed with us til now. Time Out made a big deal of it, we had 30,000 visitors. 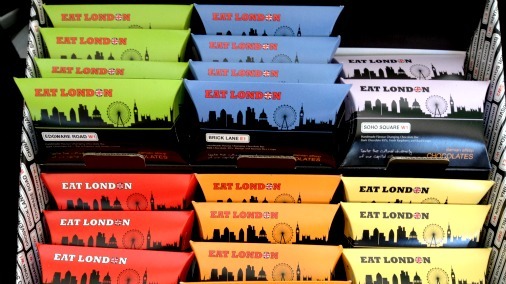 Eat London bars by Damian Allsop, multi award winning chocolatier. YR: It was April 2009. CB: I have been coming to your festivals since the beginning then! YR: It was crazy, the square had never seen so many visitors. It was really good. Then I think it was Damian who said that we should do a Christmas one. So it went biannual. 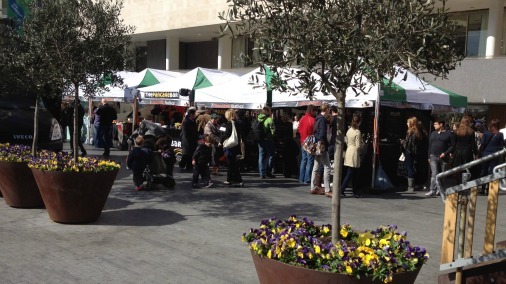 Then South Bank suggested we do a cheese one, then cheese and wine went biannually. It kind of went from there. CB: So you have been working in chocolate now for a few years, what changes have you seen? 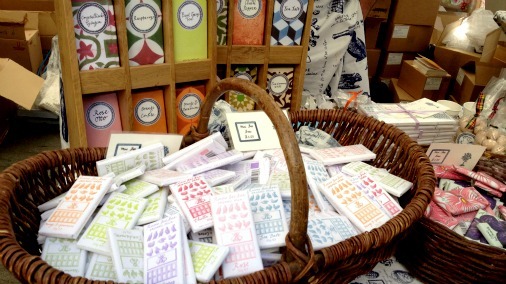 YR: It has grown massively, there are many more people making chocolate, more little businesses. Chocolate for every occasion. In case of emergency break and eat! 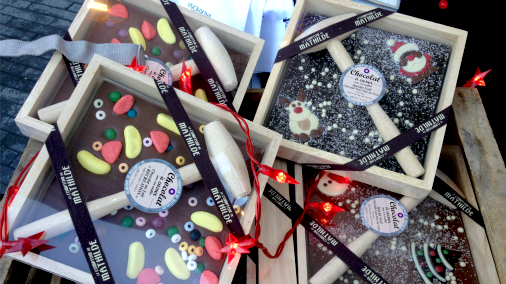 CB: More artisans and fine chocolate? YR: Not always working with the best chocolate, but more people interested and starting to work with it. So the industry has really grown. I think the UK has become more and more the place that people in Europe look to, because of the work that Martin (Christy) does and Kate (Johns). 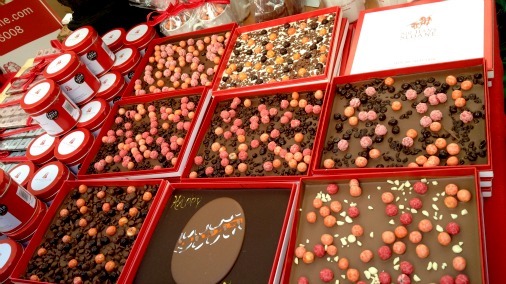 It is also really because we have amazing chocolatiers here! They are becoming more recognised, the UK is one of the chocolate capitols of the world. CB: I agree, and it was very cool to see Damian Allsop in Georg Bernadini’s book as one of the top 8 in the world! YR: Damian is one of the nicest people in chocolate, and that is well deserved. That is proof as well that it is really happening. Paul Wayne Gregory gets the crowd cheering for fine chocolate! CB: London has the potential to become a centre of connoisseurship, because we are not traditionally a chocolate making country, we are not hidebound by the traditions and expectations of say Belgium or Switzerland. YR: It will be interesting to see what will happen with the new International Chocolate Awards. CB: What other plans do you have? YR: It has been enlightening to take what I have learnt here, and to take it back to my country. CB: Lastly, what is your desert island chocolate? YR: Hot chocolate! I can’t live without it, it is my drug. Once a day I have to have it!